Restricted free agent defenseman Rasmus Ristolainen does not expect to sign a contract extension with the Buffalo Sabres before the World Cup, according to Sami Hoffrén of the Finnish sports site Urheilusanomat. The 21-year-old blueliner’s three-year entry-level contract expired earlier this offseason and he remains part of a small group of RFAs without a new contract at this point in the summer– a list that most notably includes Johnny Gaudreau (Calgary Flames), Nikita Kucherov (Tampa Bay Lightning) and Jacob Trouba (Winnipeg Jets). Ristolainen will be playing for Team Finland at the eight-team international tournament which will take place from Sept. 17 to Oct. 1 in Toronto. The NHL season begins on Oct. 12, with the Sabres set to start play on Oct. 13 against the Montreal Canadiens. The narrow timeframe between the end of the World Cup and the start of the regular season will put the Sabres in a challenging position if the club is unable to re-sign Ristolainen before the tournament begins. Earlier this summer, head coach Dan Bylsma said he anticipates fewer playing minutes for the talented defenseman. In the 2015-16 season, Ristolainen led all Sabres players in ice time with 25:16, but Bylsma said he believes that he was playing too much. 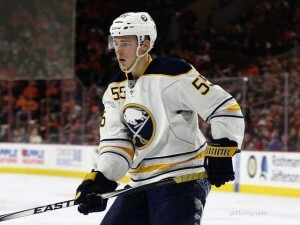 With over two weeks to go before the World Cup begins, there is still time for the Sabres to re-sign Ristolainen before he heads to the Air Canada Centre to represent his country. For Sabres fans concerned about Ristolainen at this point in the offseason, Bylsma’s comments show he is in the team’s plans for the future.